Eldest of six children born to Christophe Dufrost de Lajemmerais, who died in her youth, and Renee de Varennes; niece of Laverendrye, who 'discovered' the Rocky Mountains. Her father died when Marguerite was seven. 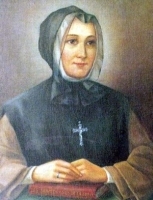 Educated for two years by the Ursulines in Quebec, she returned home at age 13 to help her mother raise her younger siblings, and to teach them what she'd learned. Her mother re-married, her step-father an Irish physician who was considered an outsider by their friends; the family fell out of favour in their own town, and moved to Montreal. There on 12 August 1722 at age 21, Marguerite married François de Youville, and the couple lived with his mother. François proved to be a negligent, adulterous bootlegger. Marguerite was mother of six children, four of whom died in infancy; both surviving sons became priests. Widowed in 1730 at age 28; François left her nothing but debt. Marguerite opened a small store to support herself and her children, and spent much of her profits helping those even poorer than herself. With the help of Father Louis Normant du Faradon and three like-minded women, she founded the Sisters of Charity of the General Hospital of Montreal (Grey Nuns) on 31 December 1737; the congregation received diocesan approval in 1755. She and her sisters took over operation of the failing and decrepit General Hospital in Montreal on 7 October 1747; Marguerite lived in the hospital the rest of her life, served as its director, and through the work of the sisters it became a success and beacon to outcasts. The hospital was nearly closed several times due to financial problems and armed conflict between the English and French for the region; Mother Marguerite and her sisters made clothes which were sold to traders in order to raise money, and her care for sick English soldiers caused them to avoid damage to the building. Today the sisters work throughout Canada, the United States, Africa, and South America. Born to a deeply religious family of high social status. At 13 he began studies at the Jesuit seminary in Belém, but anti-Jesuit sentiment in the region caused his family to move him to the Alcantarine Franciscans. 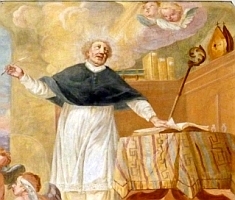 Novice at the Saint Bonaventure friary in Macacu, Rio de Janeiro, Brazil on 15 April 1760, making his final vows in the Order of Discalced Friars Minor in 1761. Ordained on 11 June 1762. Served as preacher, porter, and confessor to the local laity, and then as confessor to the Recollects of Saint Teresa in Sao Paulo, Brazil from 1769 to 1770. There he met Sister Helena Maria of the Holy Spirit who said she had visions in which Jesus was asking her to make a new foundation. Together they founded Our Lady of the Conception of Divine Providence on 2 February 1774. It was modeled after the Conceptionists, and was a home for girls who wished to live a religious life but without taking vows. When Sister Helena died in 1775, Friar Galvao served a leader for the new Recollects, supervising both spiritual development and constrution of housing for the many new sisters, and wrote their Rule. Appointed novice master in Macacu in 1781. Appointed guardian of Saint Francis Friary in Sao Paulo in 1798. Chosen definitor in 1802. Visitator general and president of the Chapter in 1808, but was forced to resign these positions due to failing health and the extensive travel requirements. Founded the Saint Clare friary in Sorocaba, Sao Paulo in 1811. Polish country lad. Brilliant student at the University of Cracow, Poland. Priest. Professor of theology at University of Cracow. Falsely accused and ousted by university rivals, at age 41 he was assigned as parish priest at Olkusz, Bohemia. He took his position seriously, and was terrified of the responsibility, but did his best. For a long time that wasn't enough for his parishioners, but in the end he won their hearts. After several years in his parish, he returned to Cracow and taught Scripture the rest of his life. John was a serious, humble man, generous to a fault with the poor, sleeping little, eating no meat and little of anything else. Pilgrim to Jerusalem, hoping to be martyred by Turks. He made four pilgrimages to Rome, carrying his luggage on his back. When warned to look after his health, he pointed out that the early desert fathers lived long lives in conditions that had nothing to recommend them but the presence of God. At the time of his death, John was so well loved that his veneration began immediately. For years his doctoral gown was worn by graduates receiving advanced degrees at the University of Cracow. He was declared patron of Poland and Lithuania in 1737 by Pope Clement XII, thirty years before his final canonization. Born a Prince, the son of Saint Sigebert III, king of Austrasia, and Chimnechild of Burgundy. Upon Sigebert's death in 656 when Dagobert was still a child, the throne was stolen by Dagobert's guardian Gimoald in order to make his own son, Childebert, king. 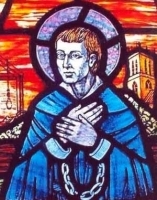 Dagobert was kidnapped and exiled to Ireland and England where he was placed with Dido, bishop of Poitiers, France. He attended school at the court of the king. Friend of Saint Wilfred of York. He married an English princess, and had several children including Saint Irmina of Oehren and Saint Adela of Pfalzel. Fought against Theodercus III. Eventually recalled to Austrasia for a supposed reunion, he died in a "hunting accident" that most considered a murder committed to permanently remove him from the throne. Born to the French nobility. Studied in Paris and the abbey of Bec in Normandy. Fellow student with Saint Anselm of Canterbury. Prior at Saint Quentin, Beauvais c.1069. Teacher. Bishop of Chartres in 1090. Consulted on matters of theology and canon law, and a strong opponent of simony. Imprisoned for opposing King Philip I's attempt to abandon his wife to make another marriage in 1092. Many of his letters and sermons survive to today. One of the most notable bishops of France at the time of the lay investiture controversy. Afflicted from birth with a severe palsy that prevented him from ever standing or even sitting unaided. His family carried him to the door of Saint Clement's church in Rome, Italy so he could beg for alms. He kept enough for the most meagre existence, giving the rest to beggars he considered poorer than himself, and buying Scriptural works that he would beg people to read to him. Saint Gregory the Great wrote about him. Born to the Icelandic nobility. Deacon by age 15, priest by 18. Studied in Paris, France and Lincoln, England, and visited London, England before returning to Iceland in 1161. Refused an arranged marriage to a wealthy widow. Founded an Augustinian abbey on his farmland, and served as its abbot. Bishop of Skalholt, Iceland. Fought simony and incontinency. Son of a tailor. Joined the Franciscans in 1537. Well-known, highly admired and sought after itinerant preacher throughout the region of Valencia, Spain. Noted for scourging himself savagely before each sermon. Mystic and visionary. Legend says that when he was in an ecstasy he would become over-heated and had to be dunked in water which would boil. 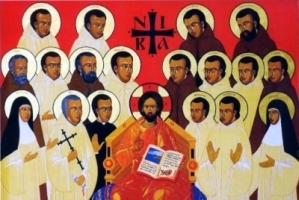 Friend of Saint Pascal Baylon, Saint Louis Bertrand and Saint John de Ribera each of whose testimony was used in Nicholas' beatification investigation. Born to the Bavarian nobility. Educated by Augustinian monks at the Saint Nikola monastery in Passau, Germany. 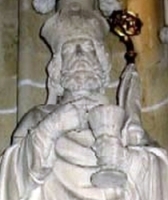 Dean of the cathedral of Salzburg, Austria in 1122. Bishop of Brixen. Counselor to his parishioners, the poor, his clergy, popes and emperors. Great benefactor to those in religious life in his diocese, especially the Benedictines. Augustinian friar at Canterbury, England. Doctor of Divinity. Professor and prior at Droitwich. 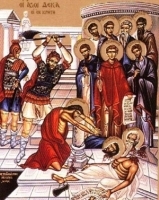 Martyred for denying royal supremacy of the Church. One of the Forty Martyrs of England and Wales. Young layman who grew up on a farm in the apostolic vicariate of Korea. Son of Saint Peter Cho Hwa-so. Catechist. Martyr. Christian imperial official in Rome, Italy. He refused to renounce his faith during the persecutions of Diocletian. Martyr. Bishop of Hexham, England for 34 years. Administered the diocese of Lindisfarne while Bishop Cynewulf was in prison. Benedictine monk. Hermit in Galacia, Spain. Monk at Toronca, Portugal, which he helped turn into a Cistercian monastery. Wrote the Rule of the Knights of Avis. Jewish convert to Christianity. Premonstratensian monk. Abbot of Scheda, archdiocese of Cologne, Germany. Leader of a group of 19 women who in the 8th century migrated from Ireland to Scotland to found a convent at Abernethy, Perthshire, Scotland on the Tay. Benedictine monk. Hermit at Pugino, near Orense, in Spanish Galicia. Fifth century abbot in Egypt.